The MANISTIQUE RIVER in Michigan’s Upper Peninsula is not listed in any fishing guidebook that I know of as a premier fishing location. 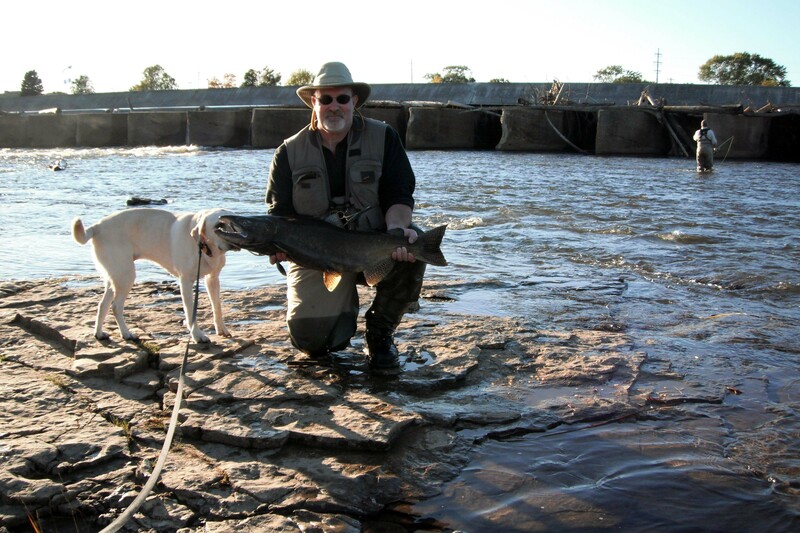 Hemmingway wrote about the Big Two Hearted River and other locations in Michigan’s Upper Peninsula and each year you can find fly fishermen that want to retrace Hemmingway’s adventures. I have never met anyone who was purposely headed to the Manistique River. The river itself empties into the northern part of Lake Michigan. It is a shallow rocky stream up to a diversion dam located in the town. The dam allows water to flow to the lake and mainly provides water for an old flume that used to feed a paper mill by the lakeshore. . I must tell you up front that if you are looking for scenic views and solitude, the lower Manistique River doesn’t have it. 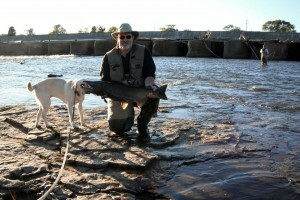 This river is an urban fishery with all the scenic beauty of an industrial park. For a number of years, a group of us would travel to the Manistique area to hunt grouse and woodcock. In the past 5 years, however, a number of us have discovered that there are more than grouse to chase in Manistique. Granted, the enjoyment of a walk in the North woods with fall colors, hunting companions and your dog has its allure. Being able to both hunt and fish the same day makes even more appealing. Apparently the local Thompson Fish Hatchery located nearby has produced various trout and salmon species for stocking in the Great Lakes. Its obvious that some of these fish are coming into the Manistique River. Additionally there are rumors of Coasters (migratory Brook Trout) being caught in small numbers adding a new reason to visit Manistique in September. 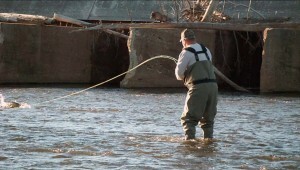 Being an urban fishery, the Manistique is a bit of a challenge to find the right place to fish. In this case you turn off a city street into what looks like an abandoned mud hole between some buildings to get to a primitive woodsy parking area. The river makes a short turn here at a large pool and runs upriver to the dam. Most fishermen here will be using spinning rods with large plugs or spoons. It gets crowded and interesting when a salmon is snagged—pardon me “caught”—in the crowd but folks are generally courteous and some large fish are even legally landed. As the stream leaves the pool it flows over a long series of rapids with a bottom composed of limestone slabs and rocks of the Niagara Escarpment (a huge expanse of limestone and shale running from Niagara Falls through the northern Great Lakes into Minnesota). I have hooked fish here using salmon or steelhead flies with a wet fly drift but the usual method is the Great Lakes “chuck and duck” with yarn eggs on a single hook rig. The water is generally 2-3 feet deep with an occasional deep rock ledge drop off. All the fish have to come up through this area. The fly fishing method also allows a fisherman to legally catch any one of the 5 species that are in the river most of the time. Snagging does occur but does not seem to be intentional. The crowd also thins out considerably because of tricky wading and the current. If you do hook a fish then all hell breaks loose because of the shallow water and slick footing. 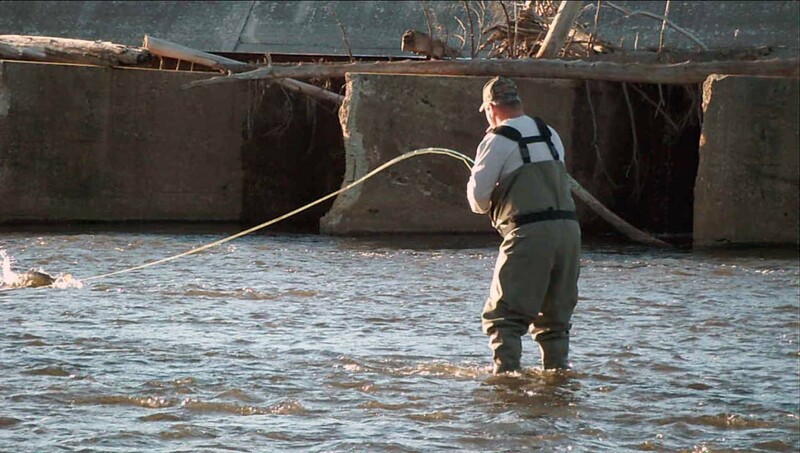 Unless it is a fish under 6 lbs most anglers have to follow the fish downstream until it tires and one of their friendly neighbors puts a net on it. I have seen guys end up a quarter mile downstream before the fish ends up netted or breaks off. The main area for fishing this way is only about 250 yards. In this stretch you can hook Chinook, Coho, Steelhead, Brown Trout and Pink Salmon. Five different species is not bad from one small area. This year our party landed a 7 lb Brown, a 16, 19 and 20 Lb salmon and a number of small Pinks and Steelhead. Not bad for an urban fishery. No it is not elephant hunting. But we get a kick out of it. October 19, 2013 in Fly fishing tales.